We had earlier shared with the ESPNcricinfo app which was available on Android and iOS, well toady the app has made its way to the Windows Phone platform for all you Cricket fans out there. Just like the Android and iOS versions, the app gives all the fixtures, match details, scores, results and news updates of every cricket team at your finger tips. There is also a magazine feature which has various categories including opinions, quotes, highlights, archives, etc. Live game coverage – Commentary, scorecard, match graphics, photographs, reports and player profiles from every international game. ‘Lean back’ mode – A unique feature where you can follow the scores in full screen mode. Place your phone on your table and follow live scores throughout a busy work day. Live Tiles – deep pin a game from the live game section and get updates delivered to your home screen. Push notifications – Get instant alerts for wickets, batsman milestones and score updates during live matches. Video/Audio – Watch and listen to the latest ESPNcricinfo video and audio podcasts. 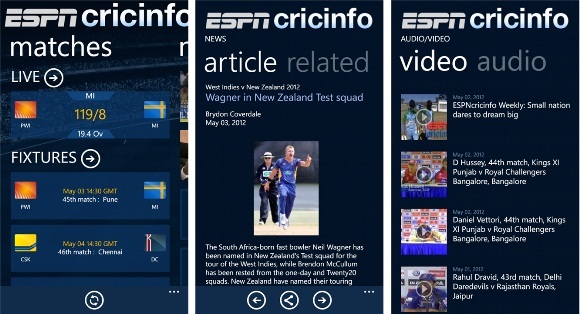 You can download the ESPNcricinfo app for your Windows Phone device by clicking the Marketplace icon below.